All kinds of businesses need exhibit systems, complete with colorful custom graphics to help communicate their message at events, conferences and trade shows. You can choose from different modular systems or combine elements to create your unique display. Pop-Up displays are an easy way to create exciting, high-impact displays that draw attention and build credibility for your company and products. They are portable, easy to set up and take down, and include a wheeled, molded plastic transport case that can be shipped or checked as baggage. Banner Stands are the quickest and easiest way for your company to display at trade shows, conferences or meetings. Perfect for lobby messages, point-of-sale promotions and new product introductions. Banner stands offer modular design and changeable panel inserts for unlimited design freedom - all at an affordable price. Panel Displays are available in both freestanding floor models and in tabletop versions that offer maximum protability. Insure you stand out on a crowded trade show floor with these affordably priced displays. 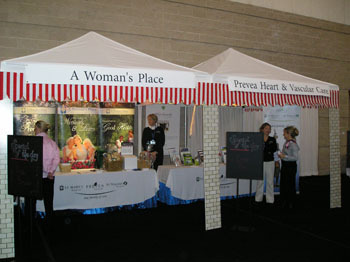 Whether you need a simple easel sign or you need a complete trade show booth we can help.